Hey, Dallas … NOW who's America's Team? A Philadelphia Eagles flag is waved after the Philadelphia Eagles beat the Minnesota Vikings in the NFC Championship Game Sunday at Lincoln Financial Field. So, this is going to be a little bit different, if not actually uncomfortable - a team from Philadelphia is going to become the latest version of America's Team. Take that you faux Dallas Cowboy fans; the Philadelphia Eagles will head into the Super Bowl and all the advance trappings as the darlings of the American public as they become the latest army to attempt to dethrone the Evil Empire of Tom Brady, Bill Belichick and the New England Patriots. This is not a case of some marketing campaign to sell t-shirts, sweatshirts and hats. This is an organic rise to the endearing status in the eyes of the public. Nothing works like the role of an underdog, and the Philadelphia Eagles have played that role to perfection. A wild turn of reality has led the city of Philadelphia and its fan base into uncharted territory. 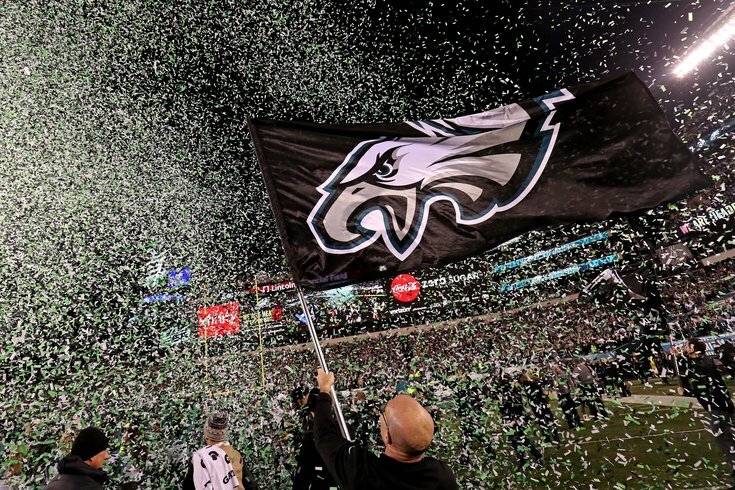 Instead of all those stories about the horrible fans of Philadelphia, the football fans of Philadelphia have been turned into the latest version of the dedicated fan base that has waited so very long for a championship - and they are right on the doorstep. Sure, there are the occasional stories about some dopey fan punching a police horse, and laughable videos of people climbing light poles. But for the most part, the past sins have been washed away in a sea of green - and a united front against the New England Patriots. Think in terms of the Chicago Cubs and their fan base as they finally won a World Series. The story of the Cubs could not be told without including the story of their fans. It was a story of generations, and so it will be with the Philadelphia Eagles. The Super Bowl will be played in Minneapolis, but you can bet there will be cameras located around the city of Philadelphia. The lights will be bright, brighter and brightest at the local sports bars as the network attempts to get a handle on the excitement level in Philadelphia. It is not often that a fan base gets so included in the success of a team. True, there are always the obligatory shots of fans in the stands who shut their eyes and pray at critical moments of a game. In this case, the eyes are wide open as everybody wants to see how Philadelphia reacts to the Eagles in a Super Bowl. The visions of what Philadelphia will be like during a parade to celebrate a Super Bowl victory will be in the back of everybody's mind. The job of Doug Pederson and the Eagles is to block out any of those visions. That job will be especially tough over the next several days as the Eagles prepare for the Patriots. The job of Pederson and the Eagles is a delicate balance of using the energy of this city to propel them toward Minneapolis – but not let it interfere with the preparations for the event. The Patriots have the advantage here – and it is not a small advantage, of having been at this moment many times. Maybe not all of the Patriots, but certainly Brady and Belichick have been through the Super Bowl experience so many times it has become no more than rote. When the media descend on the Super Bowl site for media day next week, the Patriots and their story will be old news. Cheaters? Been there, heard that. Brady and Belichick at odds? Good luck with that question. How much it means to win another? Just rewind the past decade and a half and write down those answers. On the other hand, the Eagles and their story will be fresh and will expand as the game gets closer. The allure of an underdog is a big draw on its own, but a triple underdog in terms of quarterback, coach and fan base is beyond anything Hollywood would even try to tackle. Tom Brady against an upstart future star named Carson Wentz would have had the storyline of passing the baton, but Brady against Nick Foles? It makes sense in terms of Brady getting to see Foles after Blake Bortles, but in the Super Bowl, Nick Foles becomes the latest version of Rocky. The Eagles will arrive with a locker room so loose some of the players are likely to show up for media day in dog masks. Lane Johnson has already managed to get a beer company to agree to provide libations for any upcoming party in Philadelphia. There is also Chris Long, who last spent time in the opposing locker room and has spent the better part of this season providing veteran leadership on the field, and lessons on how to be a great citizen with his off-the-field charity work. Fans of the New England Patriots don't travel nearly as well as Eagles fans, and they are numbed to the excitement of it all by the success of Brady, Belichick Gronkowski and the rest. The Philadelphia Eagles are going to provide the fresh new stories to this Super Bowl, and by the time they step on to the field for the opening kickoff, they will not only feel the passion of their hometown fans but that of most of America outside of New England.